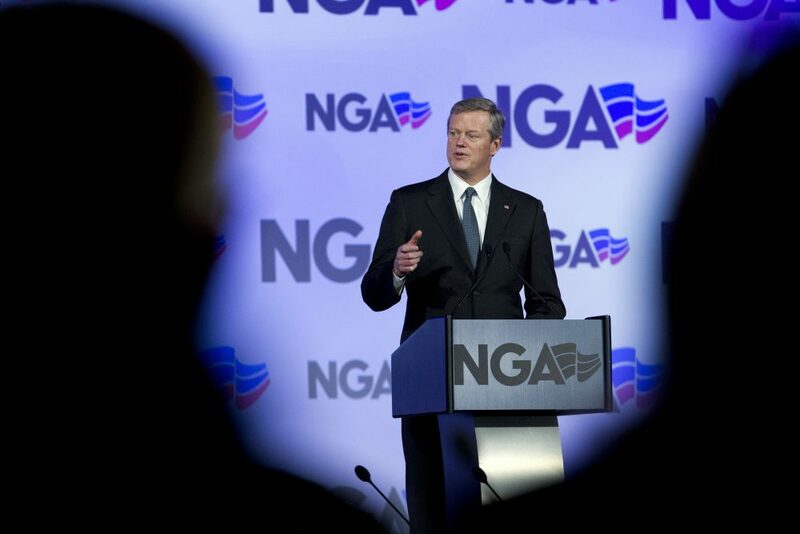 Massachusetts voters continue to give high approval ratings to Gov. Charlie Baker, who maintains a commanding lead over this three Democratic challengers, according to a new WBUR poll. The survey of 504 registered voters (topline results, crosstabs) found that two-thirds of them have a favorable view of the governor, while a majority still have not heard of the three Democrats: Jay Gonzalez, Bob Massie or Setti Warren. There are still more than seven months to go until election day, so the Democrats still have time to turn things around -- and they are running hard to try to do that. Among them is Warren, a former Newton mayor, who addressed the Democratic caucus in the town of Hull last month. "You are the reason we are beating Charlie Baker this fall," declared Warren to a roomful of Democrats who responded with enthusiastic applause. Warren is running for governor to tackle what he calls “the major issue of our time” — economic inequality. And he says Baker doesn't get it. Warren supports the so-called Fair Share Amendment, which would hike taxes on the state's richest residents and provide more revenue to invest in education and transportation. His message appeals to Debbie Bayer, a Democrat from Hull who attended the caucus and pledged her support to Warren. "I like the fact that he wants to make things more equitable in our society,” Bayer said. “I think that's our No. 1 problem right now." Despite the energy at the grassroots level among Democrats like Bayer to challenge Baker, the new WBUR polls suggests he remains broadly popular across the state. "He's maintained very high favorables, and that continues in this poll," said Steve Koczela, president of the MassINC Polling Group, which conducted the WBUR poll. According to the survey, 66 percent view Baker favorably and only 14 percent view him unfavorably. It also found that the governor is way ahead of: Warren, by 34 points; Massie, by 37 points; and Gonzalez, by 39 points. “The governor even has a lead among Democrats -- not a big one, but that tells you how significant of a lead the governor has in his re-election,” Koczela said. Among those Democrats who support Baker is G. Michael Gardiner from Boston. "I can't say, 'Wow, what an outstanding guy, what a great job he's done,' ” Gardiner said. “But … he's been a good a caretaker. He seems to get along with the head honchos in the Legislature. I don't think there's anything negative that I could point to. He's articulate — and that's pretty much it." 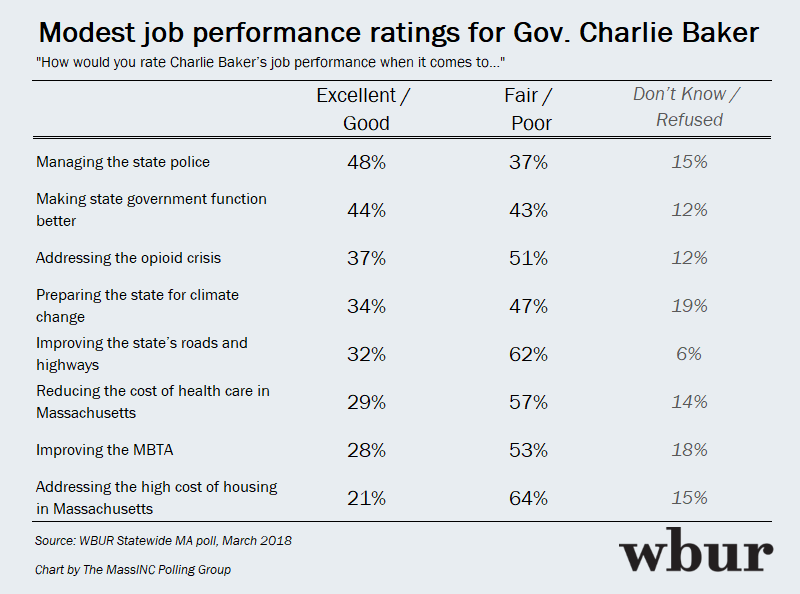 Gardiner is representative of what the WBUR poll found: overall support for Baker, but on individual policy questions, voters are less impressed, with only small minorities rating his job as "excellent." In several areas, including improving roads, reducing health care costs, addressing the opioid crisis or the high cost of housing, majorities rate his performance as just "fair" or "poor." In other words, lots of people feel OK about Baker, even if few are genuinely excited about what he's actually done. Democrats believe that provides them with an opening. "Charlie Baker doesn't think that we will fight back,” declared Massie at a Democratic Town Committee meeting in New Bedford last month. Massie, an environmentalist and author, is running for governor with big ideas of building a green economy. He told fellow Democrats in New Bedford that Baker may be popular, but that he lacks vision. To make his point, Massie resorted to some shtick: He accused the governor of duping voters with "a Jedi mind trick” and a hollow message, which Massie delivered with a tone of faux gravity. “'I'm very popular, I have a lot of money, and I'm incredibly tall,' ” Massie said, pretending to channel Baker, to the delight of his audience. Then he turned serious. “If we believe that, we're going to lose." The other Democrat in the race — Gonzalez, former Gov. Deval Patrick's former budget chief — also attacks Baker for a paucity of big ideas, and argues that he doesn't believe the governor's popularity will hold up under scrutiny. "It's easy to be popular when you don't do anything, and you never take a stand, and your whole approach to the job is being cautious instead of courageous,” Gonzalez told WBUR. “And he's got no record of any meaningful issue that makes a difference to people on a day-to-day basis, and no agenda for actually doing so." But Baker's supporters say his popularity is the result of his record of working effectively across party lines. They say he has been an effective fiscal manager, held the line on taxes, reformed the MBTA, and is a national leader in the fight against the opioid addiction crisis. In this year's State of the Commonwealth address, Baker took credit for an economy that has more people working than at any time in state history. "Our economy has added 180,000 jobs since we took office, and best of all, the number of people looking for work has dropped in every county over the last three years, and in most cases, by more than 35 percent,” Baker declared to cheering Beacon Hill lawmakers, most of whom are Democrats. The WBUR poll found that the biggest challenge for the three Democrats is that most voters — 62 to 75 percent of them -- do not know who they are. Koczela’s theory explains at least in part the attitudes of Gardiner, the Democrat from Boston who supports Baker, and who has yet to even focus on the Democratic candidates. 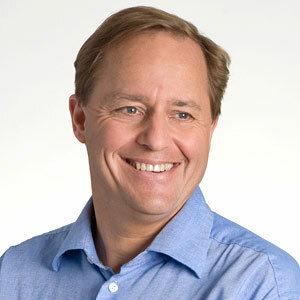 "I've been so intensely involved with the national brouhaha, so state issues have kind of taken a backseat,” Gardiner said. While it looks like a steep climb for the Democrats, Michael Dukakis, the former Massachusetts governor who teaches political science at Northeastern University, says anybody can be beaten — even Charlie Baker. Dukakis’ point is that in politics, things can change in a hurry, and there are still seven months to go -- a lot more than five weeks -- until election day. This segment aired on March 23, 2018.